Dry conditions and strong winds in California left much of the state vulnerable to massive fires, with blaze-starters ranging from a cooking fire at a drug trafficking operation to a bird flying into a power line. “It really goes to show you that it doesn’t take much with these dry conditions to start a fire,” CalFire spokesman Daniel Berlant told CNN Sunday. The fire sparked by a bird hitting a power line ignited a series of blazes in Yuba County, forcing some 1,300 firefighters to the scene and officials to declare evacuations in the town of Dobbins, he said. 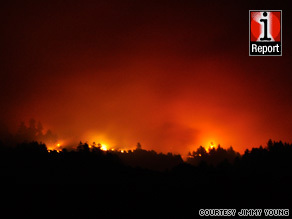 Authorities have battled the Yuba fire since Friday and expect containment by Thursday. In Southern California’s Santa Barbara County, a weeklong blaze has charred more than 84,000 acres, investigators said. The fire originated at an illegal marijuana camp believed to be run by a Mexican drug organization, the Santa Barbara County Sheriff’s Narcotics Unit said in a news release Saturday night. “I haven’t heard of any other fire starting that way,” said U.S. Forest Service spokeswoman Carol Underhill, referring to the so-called La Brea Fire. More than 2,000 firefighters are fighting the blaze, which is 35 percent contained, authorities said. Some homes around the Los Padres National Forest have been evacuated. CalFire spokesman Brent Saulsbury said 37 of the 40 fires — known as the Shasta Lightning Complex — are under control. The area is dense with timber, giving the fires serious fuel. Rugged terrain, limited access to fire trucks and the length of time it takes to reach wildfires have hindered firefighters in recent days, he said.